WATERFORD, Mich. (WJBK) - Joel Trombley was a combat medic with the Michigan Army National Guard. He served in Iraq but fell on hard times once he was medically discharged. "We were blessed with a pretty amazing group of people coming in and making our house a home," he says. 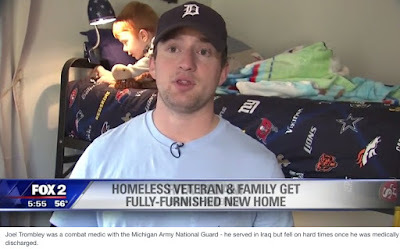 It's all part of Bank of America's Detroit Day of Giving, partnering with Humble Design to make this happen for the veteran and his family. "Today we donated $20,000 to the Humble Design organization," says Rita Oldani, Bank of America. "Today is our day of give; we are giving $720,000 out through the entire community throughout metro Detroit."